Ever since I published these photos, I know our good friend Gil has been wondering about whether the prickly pears (fichi d’India) are ripe, and well, I’m happy to announce, the time has arrived (see left)! 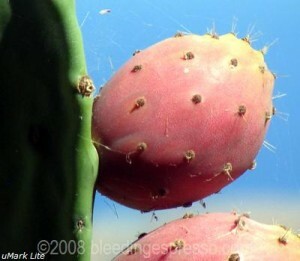 So for today’s What’s Cooking Wednesday, a quick lesson in prickly pears. DON’T TOUCH THESE WITH BARE HANDS. Yeah, the “prickly” in the name might have given you that clue, but it’s not what you think. It’s not the spines on the cactus that are prickly, it’s the tiny, nearly invisible hair-like spines that are *all over* the fruit that cause the trouble–and they are nearly impossible to wash off of you once they’re on. Trust me. It’s like having pins and needles all over your hands, and so not fun. Now, I’m not going to lie to you. I don’t clean these. This is P’s job, and although some people soak them in water beforehand is advisable, I’ve never seen him do it. He’s just really, really skilled with a knife, but I still suggest you wear gloves and watch this video to see some pros at work. 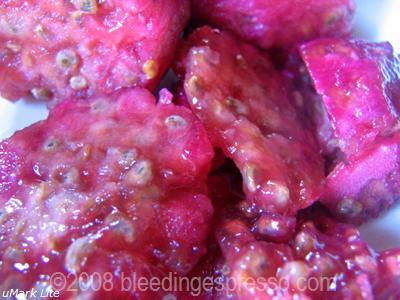 For those of you who aren’t familiar with prickly pears, you’re probably wondering what they taste like. Well, um, they’re unique. They’re sweet but not too sweet, kind of a cross between a fig and, I don’t know, a plum maybe? And truth be told, this is my favorite way to eat them. Fresh, seeds and all. Another popular way to prepare them is in jams or marmalades; you’ll find countless recipes for those with a quick Google search. Oh yes, chilled is a must…I kind of just swallow the seeds without thinking too much about it, actually…kinda like tapioca pudding. If I think too much about the lumps, it’s not as fun an experience for me. I’m going to have to look for them here in the US. I can’t remember how long it has been since I tasted a prickly pear. Hope you find some good ones Gil! Pretty! Salad ingredient with a lemon vinaigrette? Sounds delicious to me Judith! 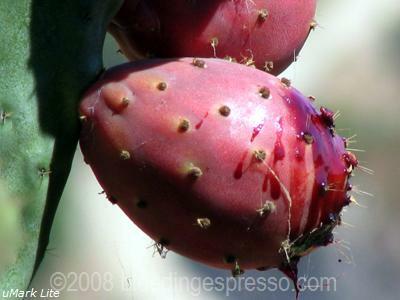 Now I wish I’d had this post to hand last year before D plucked some prickly pears from a neighbour’s cactus! Poor man was in a state for days trying to find ways of getting those nasty fine hairs from his hands. We get them here, I’ve never bought them because I’ve never known how to handle or prepare them. Your post is a real boon! Thanks for sharing! Yum! I much prefer the red ones to the yellow ones. My Dad has always been the cleaner and he never soaks them either. I must say I have never seen recipes incorporating them I have only eaten them fresh seeds and all. Off to check out the recipes. Now I am curious! I have never had these. are the seeds like raspberries and blackberries or bigger. The seeds are quite huge, IMHO. A good-sized watermelon seed is comparable, only these are round and fuller, if that makes sense. I love both the taste and the colour of a prickly pear. I recall that I took one on a hike with my wife (still dating at the time) and we had it for lunch. It was winter and the contrast of the pear against the snow was amazing. Well, I have to admit, I’ve tried prickly pears, but I’m not a big fan of them. But, maybe the ones I had (bought in the supermarket) weren’t the best examples. Yep, don’t be a dummy like me and rub your hands all over them on a dare…lol. Lucy’s last blog post..Knit? I Can’t Knit! Not Even With A Kit! They look like something I’d want to let drip off my chin! They can be juicy little suckers Heidi! I am sorry to say, they don’t look very appetizing to me. Texture and appearance are what I use to judge whether I will like a certain food or not. I guess I am a picky eater. I don’t know if I would try these or not. Maybe if they were hidden in something. I know, I should try everything once…my parents tried to teach me this and so has my husband…they still haven’t convinced me. Thotlady’s last blog post..How to waste an entire day without really trying! I must admit that it is something I have never tried…the fruit that is. The “leaves” are a common dish south of the border and you can find them some of the Mexican markets here on occasion. Being from the hills of Virginia where they are not found I guess I have missed something. I will have to look around for them because the do look tasty and yes “figgy” which I dearly love. Thanks for the information. Mmm figs…don’t get me started…. I’ve always wondered about those things–what a great post/picture. I wish I could see what they taste like because I’m having a hard time imagining it. Didn’t know what they looked like, how to handle them or what could be done with them. I can see it now… shooting a story somewhere on the other side of the world, in some remote place and I am camped out and running low on supplies… and then, lo and behold, there’s the prickly pear cactus growing, and because I learned this from you, I am SAVED! We had prickly pear gelato in Vernazza and it was sooooo tasty! You can also make a Prickly Pear Margaurita. Very tasty. Ooh great idea…I’m sure Cherrye would love that too! One of my favorite fruit eaten cold. Of course, I never buy them in the States. Can’t remember the last time I had them. 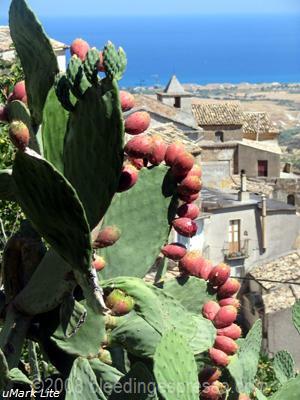 August is a great month to visit Sicily just for the fichi d’India. They are both tasty and beautiful too!! The colors are really amazing, aren’t they? By the way I have been thinking about u the last few days. I am reading a wonderful book called “The Lost Ravioli Recipes of Hoboken” and every time i pick it up to read it i think about u and your Italian recipes!! Happy Wednesday! This is fascinating, Michelle. I’ve always wanted to know more about them! I have never tried them, but I think I;d be interested. They sound good. Gotta see if somebody has them here. Except for the name I don’t really associate these with true figs at all. Both are delicious and both are full of seeds, but the flavor, texture and look are completely different. As I mentioned above I prefer my fichidindia chilled, but my favorite way to eat a true fig is straight from the tree, still warm from the sun. The prickly-pear margarita sounds delicious, btw. Thanks for linking to me!! I absolutely love prickly pears and I am trying to think of more ways I can use them. I too, love just eating them plain with the seeds and all. The guy at the farmer’s market told me the seeds are cleansing! Thanks for the tips. Now I’ll know what to do if I come across one! When I was a kid growing up in Ethiopia we used to eat these. Where I live in the US they don’t grow and are unavailable. This post made me so homesick. In Ethiopia we lived in the semi-arid part—I’ve found that not all people in Ethiopia even know what they are or how to eat them. We were spoiled, though. We bought them already devoid of the “prickles.” Every once and awhile might have slipped through—that was nasty. I hope it all goes well Bob! I’m glad you’ve had a better tasting experience than I have with fichi d’India. I tried them here in the States. They’re huge, but did not taste very sweet, and I got them at a store that usually has great fruits and vegetables. My ex was so excited when he saw them at the store here. They’re very expensive though! My ex’s parents have huge old cacti, but the fichi weren’t ready to be picked yet when I was visiting last summer. But figs… Oh my gosh! So good! I had never tried them until I went to Italy. My friends and I went to Capri and our boat’s captain brought some on-board for us. Delicious! Hope all is well over in Italy! The pears are obviously have spines that might cause you trouble once you touch them with your bare hands. I did not know about it that it can be cooked, I just had it knew that it can be great for salad. Well, I guess theres a lot that I need to know which I may find interested and for some reasons will be my best habit.